Since the dawn of popups, they have been the best friend of internet marketers, bloggers and e-commerce sites to grow their email subscribers list and display offers for visitors. Marketers have reported 1350% increase in subscription rate as well as 10X conversions using popups. Now, mobile being the hot favorite among millions, marketers targeted their email subscription popups on mobile along with desktops to boost their conversions to more than 1700%. 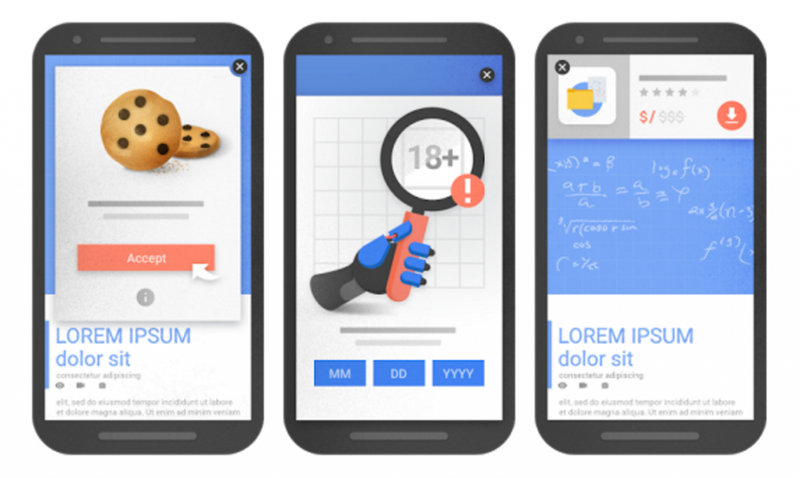 But now, suddenly Google has made a high voltage announcement that it will Penalise Mobile Pages showing Intrusive Popup & Interstitial Ads from January 10, 2017 and kick them to the bottom in search results. Oh dear!! It’s a huge punch in the face for you and me! Overlay popups, full screen Welcome Mats and standalone Interstitials have been critical conversion boosters for most people – and primary revenue source for many. With Google cracking down these pages, it’s a *$@#&$ situation. Main content getting blocked– Due to smaller screen space on mobile devices, the main content of websites got obstructed with the display of popups, full screen popups (overlays) and interstitials; also referred as the most annoying ads on mobile. Poor user experience– Pages that show intrusive interstitials provides a poorer experience to users than other pages where content is immediately accessible. Accidentally clicking ads– These annoying ads and announcements takes over the whole page and have the smallest possible button for dismissing them, which inevitably leads user to accidentally click on the ad even though the user didn’t want to. The main aim of Google Search is to help users quickly find the best answers to their questions, regardless of the device they’re using. So, to improve mobile search experience, Google decided to punish these sites by ranking them very low in search results. The worst would be to rank among the last in search results. After January 10, 2017, pages where content is not easily accessible to a user on the transition from the mobile search results may not rank as highly as they used to be earlier. What kind of popups and ads will get you punished? An intrusive Popup that covers the main content, either immediately after the user navigates to a page from the search results, or while they are looking through the page. A standalone interstitial (Full screen popup-overlay) which the user has to dismiss before accessing the main content. It’s very likely to be unhappy for you as it will take away visitors as well as ad revenue. How this penalty will affect Search Rankings? Hard to pitch offers, membership sign-ups, coupons, etc. Who will be the lucky one’s to be benefited from this punishment? 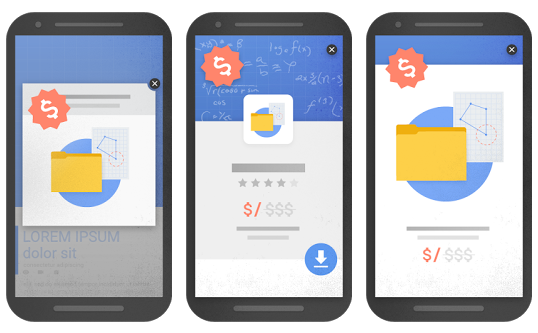 Popups, overlays and interstitials to be punished, the biggest benefit will be enjoyed by visitors and they would easily find the content visitors looking for. Who will face hard times from this punishment? 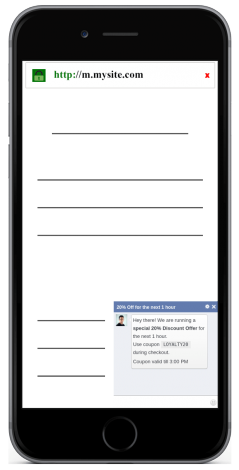 If I don’t show an ad, how will my offer be seen and how will my email subscriber list grow?? But, there’s always a solution to each problem and you won’t have to scratch your head or consult an expert for it. There are some green signals provided by Google following which popups won’t be considered punishable and won’t lower your site in search results. 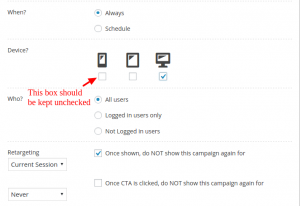 Use display targeting rules in your popup / interstitial program, and show them only on desktop / larger screens. Don’t use popups and interstitials on mobile. 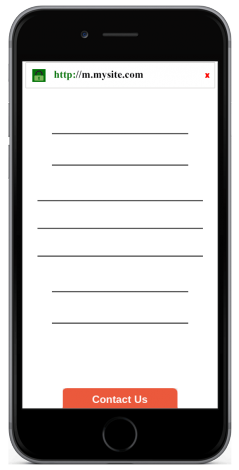 Instead use smaller messages like banners, inlines or slide ins. If you are running a popup on desktop, hide the same popup for mobile to avoid Google punishment. This is smart targeting where your popup will be shown only to visitors on desktop but not on mobile devices. If you are an Icegram user, you just need to make sure that the mobile box is kept unchecked as shown in the image below. There are tons of innovative opt-ins other than popup lighhtboxes or list builders, full screen overlays and interstitials that are highly effective. Infact, these opt-ins have given a better conversion rate, are small and smartly adjust to the mobile screen space than the age-old pop-ups. So get rid of popups and start using the below solutions/message styles to overcome Google penalty. Floating bars stick either to the top or bottom of the page making them highly noticeable and effective. They are like banners and being small, automatically gets adjusted to the screen size of mobile without obstructing the content and making your message clearly visible to your audience. Be it a newsletter subscription, giving resources, membership sign-up or offers, you can add anything. Messenger are also small size optins that can appear at any of the two bottom corners of the screen without blocking website content. Blog announcement, offer announcement, social media follow, etc. you can simply display your message. Inline opt-ins are so flexible that they can be placed within your content piece of web-page or after/before your blog post. This can be the best source for asking for email subscription. No visitor distraction at all. Tabs create huge marketing impact. They are small boxes, non-disturbing and expand on user demand. 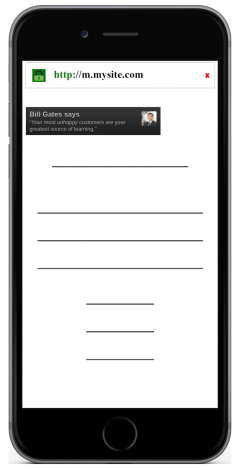 You can simply ask for feedback from audiences or post your contact details to make visitors reach out to you quickly. Toast notifications can be used for instant announcements or sharing an inspirational quote. Toast notifications are tiny boxes that uses mobile screen space cleverly completely focusing visitor’s attention on your message. What about previously targeted popups? Will Google penalize my website if I have a popup displayed on mobile view? Yes, google will most certainly penalize your website if you continue using popups on mobile view after 17th January, 2017. However, if you are an Icegram user you will not face this problem. As we have taken all the necessary precautions and made sure that websites that use Icegram’s popups stay unaffected. Along with providing you with other two options of converting ‘intrusive popups’ to friendly popups – i.e Device Targeting & Mobile Friendly Optins, Icegram automatically converts zero second popups to google friendly action bars. 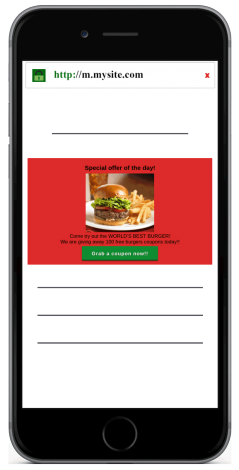 Icegram internally converts every popup that shows up at 0 seconds on the mobile device to an action bar. This action bar will show the exact headline as your original popup. And onclick of the CTA the popup will appear. Thus, not annoying the visitor in anyway. The best part is, Icegram identifies if any Icegram popup on your website is targeted at 0 seconds on a mobile device and converts it to an action bar automatically. Not giving Google a chance of penalizing your website and also saving you tons of time and effort. Want to be fully covered against the Google Penalty? Then Icegram is your go-to plugin. Icegram is a free WordPress plugin ideal for lead generation and traffic conversion. It has tons of features for making any website the best in class. 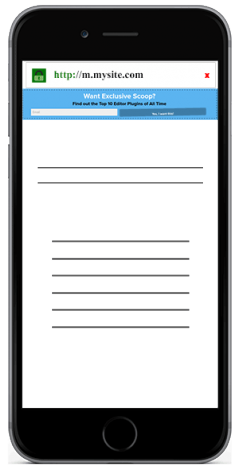 If you are a WordPress user, you can simply create and target campaigns on mobile devices. If you are a non WordPress user, Contact us and we will assist you further. Integration with all Email marketing services: MailChimp, Aweber, InfusionSoft, iContact, MailPoet, MadMimi, etc. Need more reasons on Why to Choose Icegram? Read this.. I hope you make the best of this information. Also if you’re using a zero second popup or interstitial kindly resort to one of the alternatives mentioned above. If you need any help, we’d be happy to help you. PS. Icegram completely supports Google’s policy and hopes that visitors get a better user experience real soon. And by the way.. nice plugin! Just started using it, and I’m seriously impressed with how clean and quick it is — I wanted to avoid your competitors as they seem so code-heavy. Would a popup-overlay that is triggered by the user clicking a link or button be penalised as well, or only ones that trigger automatically (after x seconds)? I’d hope Google can tell the difference and wouldn’t punish overlays that a user triggers themselves, but I’ve no idea.. Regarding your question, Google will penalize any website that shows popup on as soon as the page loads. So Icegram takes care of these popups and has converted them to two step popups. As for timed popups that is popups shown after X seconds, there’s no clear indication of how Google will treat them. So the safest bet is to use other message types to convey your message or use a link, button to show a popup if very necessary. Top bar it a good solution. Icegram pop ups are not Mobile Responsive, and are quite ugly on phones. Always hated that view on a phone. Popups on other websites often are worse. They cover the entire phone screen and you cannot access the close button! Nonsense. Yes. Top bars are any day better, safe option when it comes to popups, especially on mobile devices. Also, you will be pleased to know that we’ve worked on Icegram’s message types and now most of them are mobile responsive. Please do try out and share your experience. I am glad that Google is taking action as most of these pop ups are super annoying. But am I correct in saying that at the moment, this will only apply to mobile sites? Yes Ryan, at the moment this rule is applicable only for mobiles. I’m glad you found this article helpful.